Do we give our employees the autonomy to do their jobs? We probably think we do. But are we putting our trust in the same people? The people we always go to. The people we trust to do the job. The “heroes” on our project. 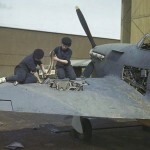 But as I researched the Battle of Britain, I found myself becoming fascinated with something else, with the unsung heroes. The ordinary men and women who ran the detection and communication system that Air Chief Marshall Hugh Dowding devised to defend England. But before I can talk about these heroes, I’ll need to give you some historical context. It all started in 1935 when Hugh Dowding commissioned an experiment with a scientist named Robert Watson-Watts. The goal was to see if they could detect aircraft entering British airspace using radio waves. The experiment was a classic example of Dowding’s practicality. On a shoestring budget, they used a van to hold the receiver and a BBC tower’s signal as the transmitter. But it worked. They could detect a aircraft flying nearby. Dowding saw the promise of this technology and immediately supported further experimentation. The technology that resulted from this investigation is known today as RADAR. But in a BBC parking lot, the British invented it. They called it Radio Direction Finding (RDF). 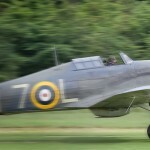 The Air Ministry thought it was a waste of time, but Dowding persevered. He was eventually allowed to develop his RDF stations with the stipulation that “the towers not interfere with the grouse hunting.” Typically British. Dowding began building his RDF stations around the coasts of England. 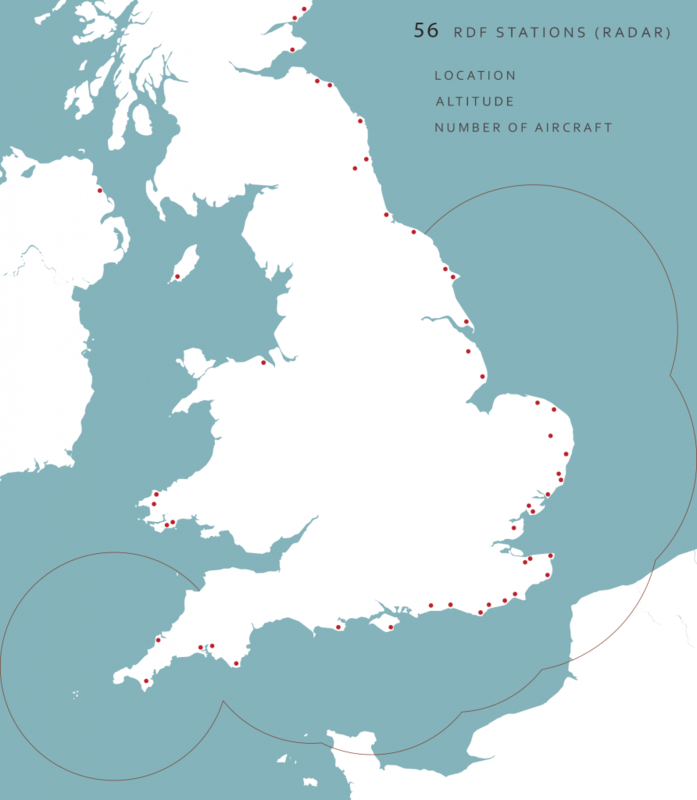 By the time the Battle of Britain was at its height, he had over 56 stations. Each of these station reported 3 key pieces of data. When it detected incoming aircraft it reported the location, altitude, and the number of aircraft. So there were 56 stations, all reporting these 3 pieces of data, continuously. This was a massive data stream. During early experiments to practice using this information his people were overwhelmed, paralyzed by the sheer volume. So Dowding built a Filter Room, at his Headquarters in London, to process the data and turn it into a useful “raid picture”. This Filter Room was a hectic, crowded room in his Headquarters that surrounded a large table. Around the table, men and women plotted and corrected the information that was streaming in from the RDF station. Despite the chaos of the room, the personnel were organized into specific roles. Plotters listened to RDF Operators and placed tokens on the map to represent what they were receiving. Filterers watched the plotting and fixed errors. 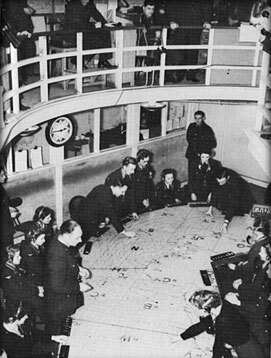 Above the table, in the balcony, the Controllers oversaw the operation and the Tellers communicated the raids throughout the entire defense system. But for this story, we will focus on just one of these roles: the Filterer. 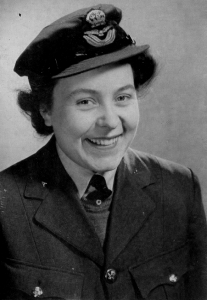 The picture on the right is Eileen Younghusband, she was a Filterer in the Dowding System. She and people like her were the real heroes of the Battle of Britain. But they weren’t typical hero types. Eileen was she fresh out of high school when she was recruited for the Women’s Auxillary Air Force (WAAF). She was young and inexperienced. Her only qualification is that she was good at math. Yet during the Battle of Britain, people like her were entrusted to make critical, crucial decisions. The pilots relied on them to process the incoming data rapidly and correctly. If they got it wrong, they or people on the ground could die. And they had to do this fast. Because modern aircraft were so fast, they had less than two minutes to take the raw data, build the raids picture, and send it on. Two minutes. And in those two minutes, Filterers like Eileen made four crucial decisions. The first decision Filterers like Eileen had to make was where the aircraft were located. Here’s a simplified example with only 2 RDF stations: Bawdsey and Dunkirk. In reality, as many as 6 stations may be reporting the same raid. The colored dots in the image are “plots”. Those tell where the RDF stations see the incoming aircraft. You can see two plots, one for each RDF station. But here is the problem…there aren’t two separate planes. Those 2 dots are the same plane. This was because RDF was experimental, there was a lot of error. If the pilots tried to intercept the incoming aircraft based on data from one RDF station, they’d likely never see it. This is why Dowding built his RDF stations in a chain, with each station supporting its neighbors. To provide redundant data sources. Even though the individual RDF stations were prone to error, multiple stations could be compared in the Filter Room to weed out the incorrect data. Two wrongs making a right. The stations determine location using 2 measurements: direction from the station (bearing), and distance (range). Bearing was inaccurate. There was a standard error. Those location plots could be 15-20% off on the bearing. Range was much more accurate. So the Filterers like Eileen used it to determine the true location of the aircraft, through a process called Range Cutting. She uses the range arcs that are drawn on the Filter Room map, moving each plot along them. This keeps the range constant. She moves them together until they intersect. That’s the aircraft’s true location. With multiple data sources she’s filtered out the inaccuracy. She knows where the aircraft are, but that’s only one decision, and the clock is still ticking. There are three more decisions to go. 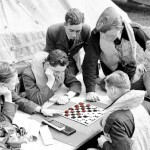 The squadrons also need to know how many aircraft are coming, so that enough fighters can be scrambled to attack them. If Eileen got this wrong the consequences could be deadly. Too few fighters launched and they could be overwhelmed. Too many and the RAF would waste its precious resources. They were already stretched thin. 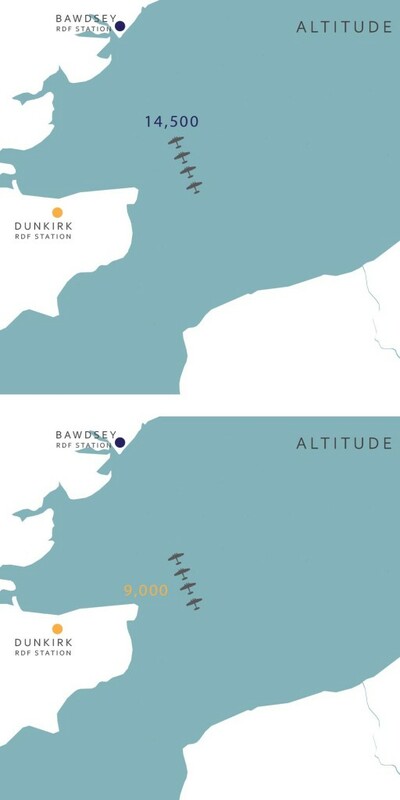 The problem here was that each station would see a different number of aircraft due to its position relative to the incoming aircraft . For example, if we have a flight of four German bombers, flying in a single line, Bawdsey station reports only one aircraft. The other aircraft are hidden by the leader. But the station at Dunkirk is positioned to the side of the raiders. This means that it is in a better position to see all the aircraft. They would report 4 aircraft. This is a very simplified example, but it is indicative of the challenges faced by the Filterers like Eileen. They have to review the information from the different stations and quickly determine which station is in a position to report the number of aircraft most accurately. A second crucial decision completed, but the clock is still ticking. The squadron pilots also need to know the altitude of the incoming aircraft. In aerial combat height is advantage. But RDF did not have an easy way to determine altitude. The operator in the receiving station had to perform complex trigonometry calculations by hand, factoring for distance and the curvature of the earth. Obviously these readings were subject to how skilled and experienced the operator was. Were they good at math? Eileen had know. She had to have intimate knowledge of not only the stations, but the people on duty there. 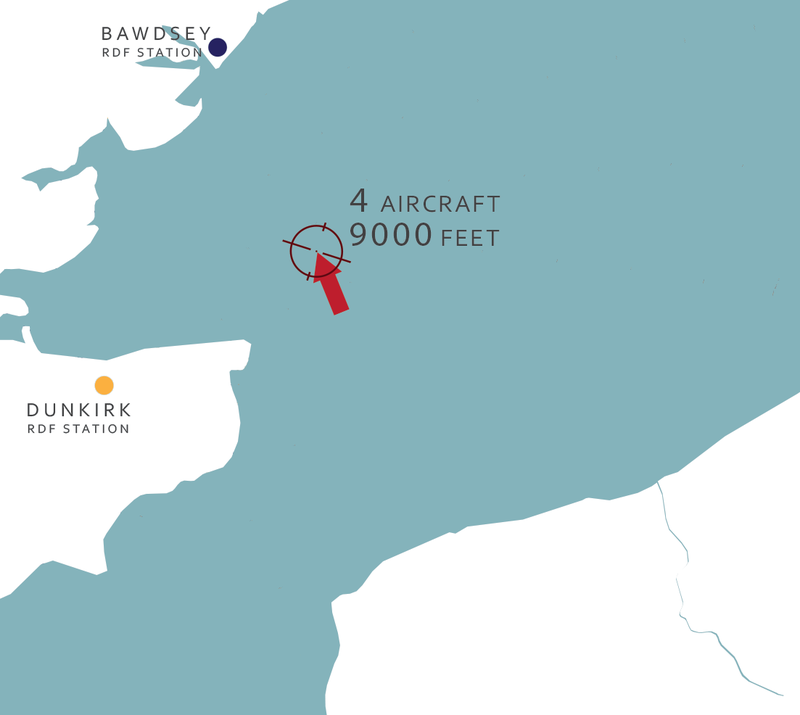 So let’s say in this example the operator at Bawdsey does the math and reports 14,500 feet, but Dunkirk’s operator has calculated it at 9,000 feet. That’s a huge discrepancy, and Eileen needs to resolve it. The obvious answer is to average them. Send the fighters to 11,750 feet. But that’s wrong. If the Germans are higher, the fighters may be “bounced” and destroyed. In this example, she knows that the operator at Bawdsey is brand new to the job and that in the past Dunkirk has always been spot on with the calculations. Dunkirk wins. 9,000 feet. One decision to go. The last thing that Eileen needs to determine is where the raiders are headed. While she is making all the other decisions, the Plotters continue plotting information from the RDF stations. When they plot a second location, the Eileen has enough information to determine where they are headed. She quickly corrects the second plot and places an arrow on the map. It points in the direction it is moving. 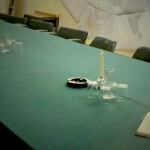 Once the arrow is placed on the table, the raid is real. No one questions or confirms the decision. It is communicated throughout the Dowding System. Tellers, standing on the balcony of the Filter Room, report it throughout the system. In less than two minutes, Filterers like Eileen made these four critical decisions. Decisions that drove the entire air defense system. Under immense pressure her judgment determined the fate of the squadron pilots and people on the ground. The system required that they make these decisions alone. There was simply no time to review, question, or approve her work. No superiors vetted her conclusions. She was young, inexperienced, and low in the organizational structure, yet she was entrusted to make decisions that affected the fate of the British Empire, and ultimately the free world. Everyone trusted her to do it, and she and countless others rose to the challenge. This is a simple example of effective autonomy. People involved in all levels of the Dowding System were granted the autonomy to do their jobs. Dowding insisted that decisions should be made at the lowest possible level. He realized that for his air defense system to work, there was no time to do otherwise. But as leaders and managers today, we probably do not face the same constraints. Most of us have more than two minutes to make crucial decisions. But does that mean that we shouldn’t give our employees the same autonomy in their jobs? This question is a hot topic in leadership right now. Dan Pink’s “Motivation 2.0” argues what Hugh Dowding already knew; that if you want the best from your employees, you should empower them to do their jobs. To make critical decisions. To take risks. To fail. But it’s not enough just to say autonomy is good. Is all autonomy good for employee engagement? Is complete autonomy good for the organization? What does effective autonomy look like? How do you give your employees meaningful autonomy in a rigid, controlled environment? Let’s start by looking at Eileen in the Filter Room. She obviously did not have complete autonomy. She was part of rigid military hierarchy. She worked in scheduled shifts. She faced stiff penalties for tardiness. She put on a uniform, wore her hair in the prescribed manner, and saluted her superiors. This is the opposite of autonomy. But despite her controlled work environment, she was given a free hand to make crucial decisions. But even those decisions were part of a well-defined process. She knew what to expect, what decisions had to be made, and how fast she had to make them. There was even a well defined process to make those decisions. Today, this may reek of micromanagement. But it is not. The constraints imposed on Eileen’s work, coupled with her authority to make decisions, both defined her job and allowed her to master it. Micromanagement removes the authority to make decisions. Someone is always checking your work and requiring approval. That is the critical difference that defines the real problem. We think autonomy is an “all or nothing” proposition. That to engage our employees we have to let them have a free hand to define their jobs, their responsibilities, and their goals. But this is wrong. At the extremes, these types of environments hurt engagement, descending into chaos. So instead we decide to give our employees tokens of autonomy: flexible schedules, telework, relaxed dress codes, etc. Read a few blogs on the subject; those are the typical solutions for autonomy in the workplace. 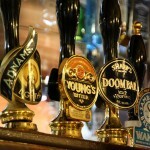 These are the snake oil for increasing engagement. But I’ll argue that they are ineffective, because they are short-term fixes to the larger problem. Don’t believe me? Ask your employees which they would prefer: a game room at the office or the authority to own meaningful decisions in their work. Let’s start a discussion about this. In the comments tell me about how you are struggling with autonomy and your workforce. What does autonomy look like in your teams? Tell me about a time that an experiment with autonomy failed. This entry was posted in History, Leadership and tagged autonomy, big data, decision making, Eileen, engagement, filter room. Bookmark the permalink.